The HQ hack of changing file durations to cheat youtube no longer works. 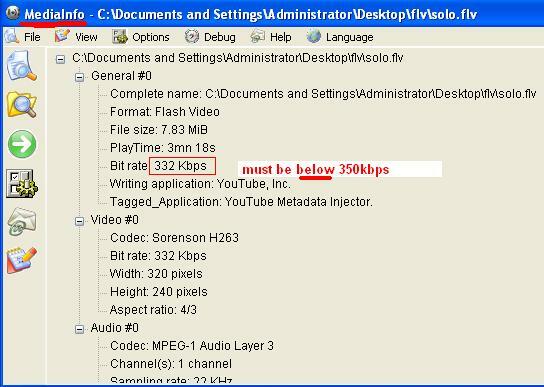 NOR can you still upload flv files with a total bitrate under 350k, and bypass re-encoding. at the moment you can upload an FLV1 Flash clip to youtube and have it pass under the radar unconverted. Please note this applies to FLV1 only, VP6 will not work and will be reconverted. This saves a lot of time during upload, because you're uploading a lot smaller files. and you get control over your content. mencoder / ffmpeg and your source video in a working folder. you may or may not want to go through this prep, and use avisynth. I use avisynth for everything. Install avisynth if you haven't already. If it's 4/3 already it's dead simple. If it's wide, you have to letterbox. This is not a resizing guide. and do other filtering in avisynth. your source video and ffmpeg. The above was 2.35:1, and I preferred to chop the sides rather than pad top/bottom. I use a sharp resizer, because that's what I like. I dropped the framerate to get more mileage from the bitrate. I opted for a resolution the size of the standard youtube display. You can do anything you like! there's a 350kbps total bitrate limit. you have to stay under that limit. If not, you have the 10 min youtube limitation. note: audio samplerate must be 44100, 22050 or 11025.
you can of course change samplerate before you get to the encoder. You can use mencoder to simplify the process. feed your source to mencoder and go. but i'd be using avisynth if i wanted to tamper. You cheat by changing the reported duration info in the flv header. 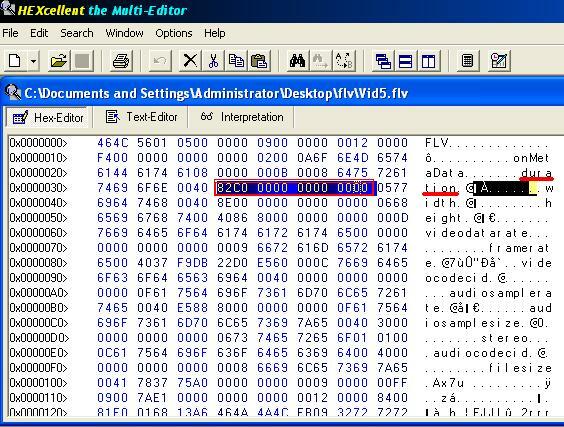 Open your flv in a hex editor. starting from the left you have the first value, we'll call it 'a'. so "5000 0000 0000 0000" is 2*2^5=64 seconds. The second value, say 'b', is b/16*(2*2^a). "82C0 0000 0000 0000" is 10 mins, our limit. See appendix for useful hex values. or just keep trying upping the duration bit by bit. where i upped things just a bit. encoded 2 mins, to flv (1500k) with 192k audio. Got about 25MB. Changed duration in header to 10 mins. Having 'heavy' videos that aren't streamable is not the point of the guide. But basically you have the freedom to do what you please. The whole process has the benefit of flexibility. You have a great amount of control this way. Helluva guide, 45tripp, for someone that says he doesn't write guides. I'm sure it'll be much appreciated. 45tripp, that is probably the best quality video I've ever seen on Youtube! And, is it just the standard h.263Sorenson codec that is allowed for video? Also noticed you said early on to use 11/22/44kHz, but then you ended up using 48k--so you can cheat there too? no I couldn't have used 48khz. It's an flv container limitation. Where you can also cheat is framerate. A youtube re-encode won't let you keep anything above 30fps. However, with Flash 9.0 none of this will be necessary. Matters of great concern should be taken lightly. Matters of small concern should be taken seriously. and checking with mediainfo, the header again shows 5 mins 25 secs. i looked at winff, and it seems to use the command almost verbatim. you may want to edit the preset to remove framerate,scaling options. don't really know what else. Automen, nice tool that at the same bitrate of the others prouced by far the better quality, not as any blocks. and what not in the same folder as Automen, plus it's not configurable. slight hinderance as it may be, it's stopped me from trying it so far. hi i tried several programs and using a dv video as source i cant get the video quality as your 300 trailer at 400k at 448.336 resolution. My video is not block free. there are many ideas in the thread. could drop resolution, framerate, maybe crop. I butchered framerate, dropping almost 20% of the frames. could probably attempt using some filtering. using winff, the final combined bitrate is shown in the dos window accurate to 0.1 kbps. You need not use media info. MUST use TVC v3.10, not 3.11. The trick is to use the highest bit rate and not have YT recode. A 2:30 minute video might work with 15 frame rate, at 860 bit rate. If YT recodes, try again with lower bit rate. At 15 frame rate a 1000 bit rate seems to = 4 minutes on TY. 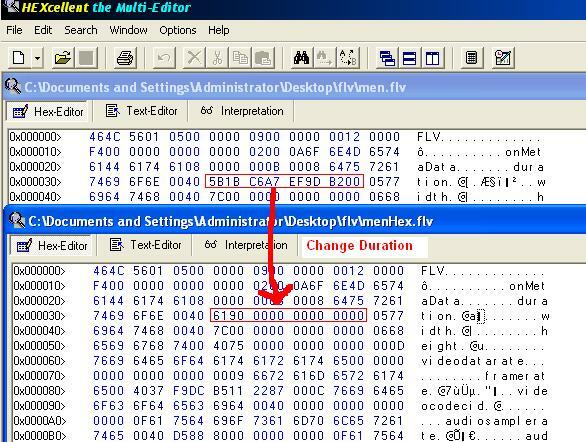 I have not tried editing the header with hex editor to try and post longer vids, it may work. goyomora posted his method in the thread. and it helped directing me towards my method. c. no stupidly high audio bitrates. e. A 2:30 minute video might work with 15 frame rate, at 860 bit rate. If YT recodes, try again with lower bit rate. I already know what works before uploading. Excellent, I will try it. But is your method limited to under 350 bit rate? Also, can they play up to 3-5 minutes, or even up to 10 miuntes in the hq mode? Excellent, I will try it. But is your method limited to under 350 bit rate? File duration is altered to cheat. If you follow the guide you'll see how it works. The limit is the youtube 10min mark. Excellent tutorial. I used 'SUPER' for the encoding, it produced excellent 345-347 KBps videos, and YouTube was happy to pass them through unscathed. I used the default webpage uploader. so you want to be in 4:3 too. else you'll litter your material with artifacts. I am sorry. I should have been more clear in my question. My point is that there is significant advantage from being in the native display resolution, so that scaling is not required on playback. Doesn't change my answer much. It's just more efficient having mod16 encodes, and hence preferable. My point is that there is significant advantage from being in the native display resolution, so that scaling is not required on playback. You seem to be answering yourself. Pick the resolution you're most likely to be displayed in then. or the mod16 rez of the existing choices. I tried virtually every type of encoding software, including the TVC Goyomora Method and other methods.. AND BE FAR , The BEST Method is yours.. I appreciate Your wonderful tutorial here. I just use TVC way. Work very well for me. Amazing but much too daunting for a geezer like me. I downloaded TVC and I'm getting the worst blocking. What are your settings, Timmychuck? I'd love to able to get this kind of quality by I couldn't swing this guide, must be my brain or lack thereof. try again. be specific about where you get stuck. try avanti, 45stripp kindly made a profile for it (thanks). From all that i tried it it was the one that gave me the best results even when "respecting" the 350 bitrate rule. Well, I d/l avanti and have no idea what it is for or what to do with it. I don't think there's anything you could do to improve my I.Q. It's obviously a great guide judging by the comments here, it's just completely beyond my comprehension from Step 1. I do appreciate your response. Poor quality following upload to YouTube-can anyone assist?